"When something like this happens.. I want to pack up and move back." 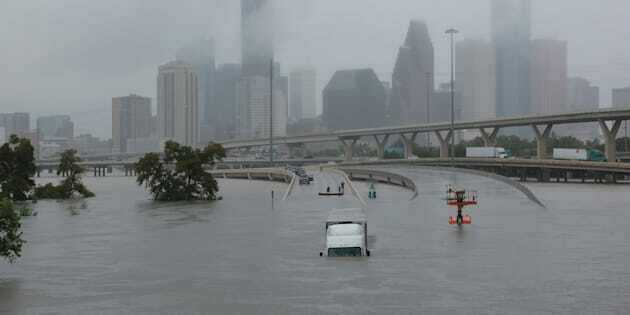 HOUSTON — Canadian expats living in Texas said they've gone days without sleep as the remnants of hurricane Harvey continue to deluge the southeast coast Sunday. Megan Giffin-Scheffers, who moved from Halifax to Houston four years ago, said "everything is overflowing'' in the Texas city, which is the fourth-largest in the U.S., as rising waters force thousands of people out of their homes. Giffin-Scheffers, a mother of three, said she hasn't slept properly in two days as she and her husband take shifts on the lookout for signs of danger. Every time her phone lights up with a tornado alert, her family has to hunker down in their pantry as wind gusts howl through the city like "freight trains,'' she said. Isabelle Dion, who is from Saint-Cesaire, Que., says her home in Houston has been spared from damage, but it's scary not to know what will happen when night falls. For three days, Khondker, who is from Toronto, has been working tirelessly to manage "one thing after another,'' driving through water-choked streets to help out where he can. We just don't know how much water we are going to see. Khondker said houses in his neighbourhood have been turned "upside down,'' and rising waters in a nearby river threaten to send a potentially catastrophic flood into the area.